“Use your imagination,” my mother exasperatedly replied to my whiny claims of boredom one day when I was little. “I don’t have any!” I dramatically exclaimed. But the truth is, my childhood was replete with unstructured time and full of imaginative play. I fear, however, that for this generation of students who are intensely scheduled, pressured and expected to excel in all areas of life except free time, that answer might just be true. We all want what’s best for our children, but determining what that is and how to get there is not easy. In our best effort to shepherd them through this competitive, harsh world, we fight their every battle, smooth every bump, give them every advantage and then we wonder why they can’t do anything for themselves. Collectively, as helicopter parents of the fragile teacup generation, we view the nurturing years as a complex battle strategy of defense and attack, and we’re arming ourselves to the teeth. It’s exhausting and ultimately not helpful for our kids. A practicing psychologist and bestselling author, Dr. Madeline Levine has identified alarming rates of depression among teenagers who are adored by their parents and successful by any measure, but who are feeling empty and lost, with no sense of self, or purpose in life. Dr. Levine has dedicated her recent years of practice to identifying this alarming trend of performance-based, pressure-cooker culture among teens and offering alternative parenting strategies to help mitigate it. 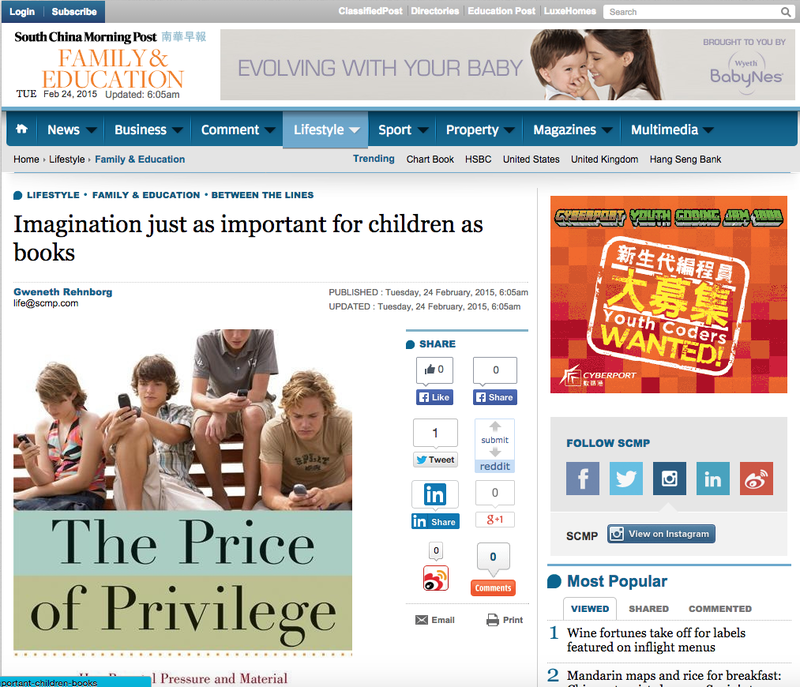 In her bestselling book, The Price of Privilege, Dr. Levine explains how parental pressure and material advantage are creating a generation of disconnected and unhappy kids. Her second book, Teach Your Children Well tackles the contemporary narrow definition of success and provides practical suggestions for raising truly successful children in all aspects of life. In addition to the work of Doctor Levine, many child development specialists, college admissions officers and companies are reexamining their true determinants of success. Perusing Stanford University’s Challenge Success website nets a treasure trove of research-based resources for parents and educators who believe that schools these days are too focused on grades and test scores. Instead, they should focus on creativity, adaptability, critical thinking, collaboration and communication leading to greater resilience, success and ultimately more meaningful lives. More than an additional extracurricular activity, tutor or AP class, children need time to be bored and the space to think deeply about ideas, discovering who they are as much as what they can do. After all, there really is no proven formula for future success and happiness, so why make adolescence so unpleasant? Why not enjoy our kids and listen to them, try to make the best decisions we can for them while we have the luxury of being the decision-makers, but more importantly, try to plant the seeds for them to make good decisions for themselves in the future? Dr. Madeline Levine will be in Hong Kong on March 11 to speak at the HK Convention Centre at 7 p.m. as a guest of Bring Me A Book. Tickets can be purchased through HK Ticketing.